Notable Canadian space events for 2018. Credit: SpaceQ. What are some of the notable happenings in Canadian space in 2018? Here’s a hint, the first notable event happens in 8 days with a rocket launch in India. At this time India is targeting January 10 for its next launch. The main payload is an Indian earth observation satellite, Cartosat-2. Also along for the ride are 30 secondary payloads that include two Canadian small satellites. One of those satellites is the Telesat LEO Vantage 1 which is their first demo satellite of their new Low Earth Orbit (LEO) constellation. The other Telesat LEO Vantage satellite was lost in late November when a Russian launch vehicle failed to reach orbit. You can listen to my podcast with Telerat CEO Dan Goldberg to learn more about the mission. Also possibly this year* Toronto based Kepler Communications will have its first satellite, Kepler 1 launched. The satellite is their first and is part of their planned machine-to-machine LEO constellation. File photo from November 7, 2017. The first Telesat LEO prototype satellite is ready and at the Russian launch complex. Credit: SSL. The Canadian Space Commerce Association is holding the second Canadian SmallSat Symposium in Toronto between February 13-15. The last SmallSat Symposium was also held in Toronto in February 2016. The Association is expecting upwards of 400 participants. You can learn more about small satellites and the conference in this recent podcast I did with Canadian Space Commerce Association Executive Director Michelle Mendes. Also in February in Toronto is the Women in Planetary Science and Exploration. This event will be held February 17-18 at the University of Toronto. The Canadian Aeronautics and Space Institute (CASI) is holding its biennial conference, ASTRO 2018, in Quebec City this year between May 15-17. The event is always a highlight of the calendar year in which it takes place with a great lineup of domestic and international speakers. 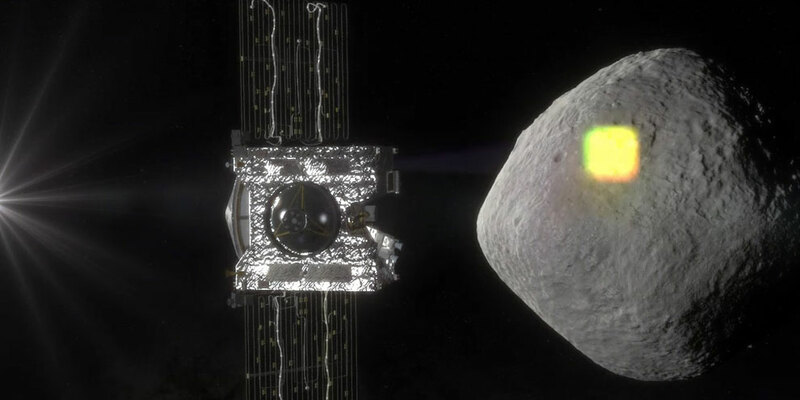 In August the Osiris-REX spacecraft will rendezvous with near Earth asteroid Bennu. For Canada, this is a major highlight in 2018 as we contributed the OSIRIS-REx Laser Altimeter or OLA, which will create a 3-D map of asteroid Bennu’s shape along with helping with navigation. Dr. Michael Daly, Associate Professor at York University is the principal Investigator of the Canadian Science Team. Listen to my podcast with Dr. Daly to learn more about the mission and Canada’s contribution. The mapping of the near-Earth asteroid Bennu is one of the science goals of NASA’s OSIRIS-REx mission, and an integral part of spacecraft operations. Credit: NASA. 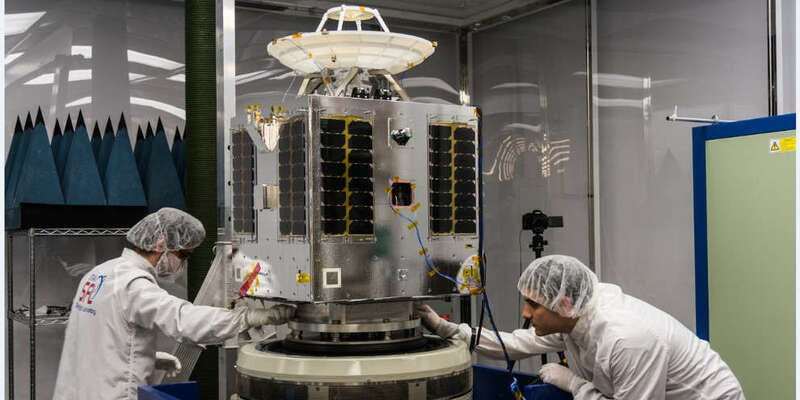 It’s expected that in the late summer or early fall a refurbished SpaceX Falcon 9 will launch a trio of satellites that make up the governments next-generation earth observation synthetic aperture radar RADARSAT Constellation Mission. The mission is Canada’s biggest project in recent memory costing over a $1 billion. The satellites were built by prime contractor MDA and included Magellan Aerospace as one of the subcontractors. 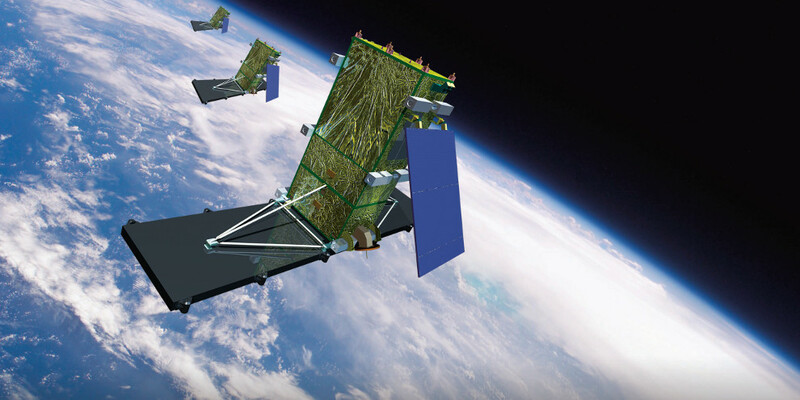 RADARSAT Constellation Mission (3 satellites). Credit: MDA. It’s be a long five years since a Canadian astronaut ventured into space. But this November David Saint-Jacques will launch from Kazakhstan on a Russian Soyuz spacecraft for a six month stay on the International Space Station. Recently the Canadian Space Agency revealed some of the new experiments he’ll perform. * Updated (January 4, 2018 6:15 p.m. EST): The story has been updated to reflect that the Kepler Communications launch of Kepler 1 is still to be announced and won’t be launching on India’s PSLV-C40 upcoming launch tentatively scheduled for January 12, 2018.